A lost and found story. Louie and the Lovers from Salinas, California put out this one record, discovered and produced by the legendary Doug Sahm during his exile from Texas; it barely sold. But Rise was such a strong album, a startling blend of the San Francisco sound, Chicano music, and Tex-Mex country rock, it became an easy target for collectors. Rarer, however, was the fabled follow-up album, lost in a fire save for one cassette and unreleased until Bear Family’s recent offering, Louie and the Lovers, The Complete Recordings. For a bunch of teenagers recording their first album in one 18-hour session, Rise is a surprisingly solid set of tunes, with a sound as fresh as any of their west coast contemporaries, consistently fine song craft (9 of 11 tracks penned by Louie Ortega), and fantastic vocal performances throughout. You can hear the Lovers’ innocent enthusiasm chiming through electric rhythm guitars and the band’s raw energy is infectious. The Lovers were admittedly influenced by CCR, an unavoidable comparison, but Louie also name checks Webb Pierce, Lefty Frizzell, and Jorge Negrete as early influences on his songwriting. Rise takes off with a double guitar hook assault and soaring vocal harmonies on the eponymous opener. But the album’s slower numbers are some of the record’s best: “I’ve Always Got You On My Mind” is a serious earworm and “Driver Go Slow” is a sparse and haunting murder ballad. Upbeat rockers like “Royal Oakie” and “I Know You Know” should have been radio hits, at least in Texas. The album is a powerful grower, its melodies sinking in deep after a few listens, but unfortunately Rise was destined for obscurity. Regardless of the lack of sales, The Lovers were given another shot at recording an album, this time featuring production from Doug Sahm, Jerry Wexler, and Tom Dowd, along with help from new guitarist John Rendon, steel guitarist Charlie Owens, horn player David ‘Fathead’ Newman, Dr. John on keys, percussionist Joe Lala, and Flaco Jimenez on Conjunto accordion. The selections were more diverse, from Mexican traditionals to sunshine pop and Memphis-powered blues jams (probably Sahm’s ever present musical schizophrenia peeking through). Perhaps the magic from the original sessions had faded, but these tracks are a pleasure to finally hear, with some certain gems in the mix, included in a fine package with excellent liners. Really, really been digging the Rising Storm contributions. Excellent stuff. 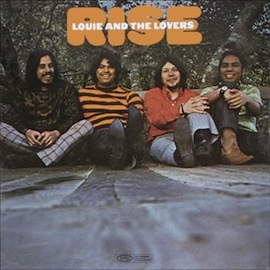 Nice find on the Louie and The Lovers…my pops dug this local band. Salinas, Ca. is my hometown. Sir Douglas/Doug Sahm were always high on his 45 playlist at well…I remember the tunes well as a little kid. Small world. I agree this CD is a great find for anyone! This band needs to have a reunion tour! Louie and the Lovers are the real deal! KLRN Ch-9 San Antonio, TX will be airing the Texas Music Extravaganza Saturday, December 12th at 10pm. The extraordinary impact of some of South Texas’ most celebrated musicians is the focus of this documentary musical journey. Filmed in High Definition, the Texas Music Extravaganza includes performances from a pivotal concert on Aug. 27, 2009 in San Antonio, Texas that featured alumni of the Sir Douglas Quintet and Texas Tornados with Augie Meyers, Flaco Jimenez, Shawn Sahm, Jack Barber, Ernie Durawa and others. The concert benefited the March of Dimes organization, and also featured dynamic performances by Grammy Award winner Raul Malo, The Krayolas, West Side Horns and Adam Aguilar. The event marked the debut of the highly anticipated supergroup the Vato Valley Boys, featuring Augie and Flaco with Bluegrass legends Byron Berline, Dan Crary and John Hickman. Produced by Bill Millet and directed by award winning Latino film maker AJ Garces, the Texas Music Extravaganza Film also delves into the legacy of Doug Sahm, Augie Meyers and Flaco Jimenez. More info can be found at Texas Music Extravaganza’s Website.